Western Window Systems, LLC (“Western Windows”) is a leading regional manufacturer of high-quality, custom aluminum windows and doors for luxury homes, as well as hotels and office buildings. The Company’s products are sold through an established network of window and door dealers located throughout the southwestern United States, Hawaii, and Mexico. MelCap Partners acted as the sell side advisor to Western Windows. 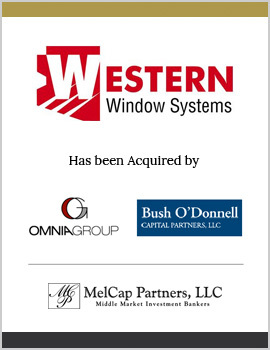 Western Windows was successfully sold to The Omnia Group, LLC and Bush O’Donnell Capital Partners, LLC, two experienced private equity groups.